Dog's Declaration [W5422] - $18.00 : Yarn Tree, Your wholesale source for cross stitch supplies. 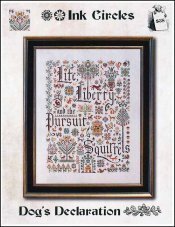 Cross stitch pattern by Ink Circles. The "Dog's Declaration," includes "Life, Liberty, and the Pursuit of Squirrels." When asking dogs why they are so "dog-on" happy...pursuing squirrels, birds, and the like was one of the very reasons. Filled with puppy dogs, squirrels, dog houses, flowers, etc., this design is too "dog-on" cute to pass it up! Stitch count is 243w x 315h.